Hello, my name is Melany and I’m 4 years old. I live in Mexico City, a big city with a lot of cars, people, houses, streets, stores and noise. My mom takes me to school by bus every day. She says I have to pay attention because it’s dangerous. My school is the place I like the most because I can learn and it’s quiet and clean. They give me healthy things to eat and I can play with my friends. During the holidays I missed coming to school to study and seeing my friends. I like coloring, but I like it best when my friend Paty colors with me. I also like playing with the blocks in my classroom. It’s fun, we use them to build things. I love building robots the most – I make them large and colorful. 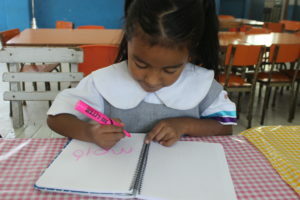 Melany shows how she’s learned to write her name. They are teaching me numbers and letters. I can write my name all by myself now. My teacher helped me a lot. “M” is the easiest letter because it’s the first and the “a” is always the hardest. My friends from “Los Children” (Save the Children) visit my school sometimes, the ones with the red t-shirts. They helped us form a committee, which I love to be a part of with the other kids in my class. When we get together we talk about our school, like about the yard toys that are old and can cut us. Then we talk about how we can fix them. We think it is important to tell all the other children about our committee so that they can help us take care of our school, too. We also learn how to know dangerous situations, and how to protect ourselves when we are out in the city. We include our parents in our meetings sometimes, to support us in keeping our school clean and safe. Melany playing with blocks, getting ready to build a “robot”. “Los Children” came once to measure me and they told me I am healthy, but that I had to eat well and exercise to stay that way. That’s why those same friends came to talk with my mom and my teachers, and they taught them how to prepare good and delicious food for me, something our parents didn’t know so much about before. I like eating in my school, the food is always yummy. I like soup and fruits, especially mangos and strawberries. The children’s committee and Save the Children have set up a school orchard, too. There we have planted many different things, and we are waiting for them to grow so that we can soon prepare more healthy food with these vegetables. 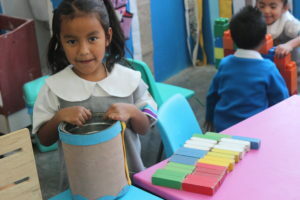 Thanks to support from our sponsors, Save the Children Mexico is giving children a healthy start in life, the opportunity to learn and protection from harm. 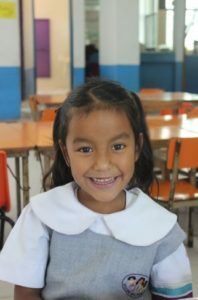 Thank you from Mexico City to all of our sponsors who have helped make life better for children like Melany and her classmates!